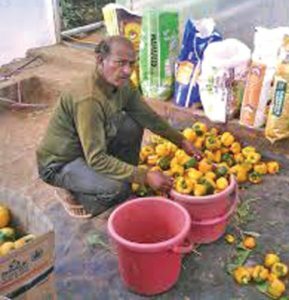 “Post retirement from army I returned back home and decided to do farming. As we are agriculture based family we had been growing different crops in open cultivation and the economies had been the same always. I wanted to have some change and significant growth so decided on hi-tech farming! I wanted to cope smartly with the constraints precisely high temperature in our region, less water and less space so selected coloured capsicum cultivation in poly house. The production attained in 10 acre open cultivation can be achieved in just 0.25 acre in poly house! Water is also utilized proficiently and temperature can be controlled very well,” says Mr. Malagonda S Biradar on his hi-tech farming venture. His farm is located at Kanamadi village near Bijapur, Karnataka. Other than poly house farming he also has pomegranate and grapes orchard as well as grows maize, green gram and black gram in open cultivation. Usually the cost of saplings varies between Rs. 6-9/plant. The saplings are transplanted on 2 feet wide bed keeping the plant-plant distance as 1.5 feet and row – row distance 18inches. “I have planted saplings in a zig-zag manner. It implies one line of plants will be in a row and next line will have plants in between two plants of the first line. We may have one plant less in this system yet it is helpful because the gaps in between allows the free movements for working and the branches will get sufficient space to grow,” he explains. Capsicum plants grow upto 15 feet thus leaves no space for intercropping. To stimulate plant growth different bio-fertilizers are used. However to secure the crop from the fungus attack some chemical based fungicides are used ensuring there is no residue left behind. Pruning is also must for good growth of the plants. Leaving four branches in every capsicum plant rest all are pruned/cut. It is done so to support the growth and weight of the capsicum from 150-300 gram. Fruits below 150 gram will not have good selling value in the markets. All four branches of the plant will be supported by thread. The plant will be twisted with the thread to aid harvesting and it looks like an umbrella,” elucidates Mr. Biradar. Minimum selling price of coloured capsicum was Rs. 50/kg. “We used to harvest in the morning and pack in carton box lined with paper. The box was sealed with a plastic belt. The boxes were sent through bus to Mumbai market. We had a three-year tie up with one trader,” he shares. As the present operations are functioning smoothly, Mr. Biradar next plans for setting up a vermicompost unit and a new poly house in 2-3 acre. In this new poly house too he shall be first cultivating coloured capsicum and then export it himself by taking other farmers too in the network. “I am convinced that agriculture is profitable if done with sincerity and taking advantage of technology. I earn close to Rs. 4lakhs/10guntas as profit after deducting all my expenses. Farmers need to think and act like entrepreneur and he will prosper!” he concludes.